Now that the cooler weather is here reading just seem like a better choice to do at night before bed. 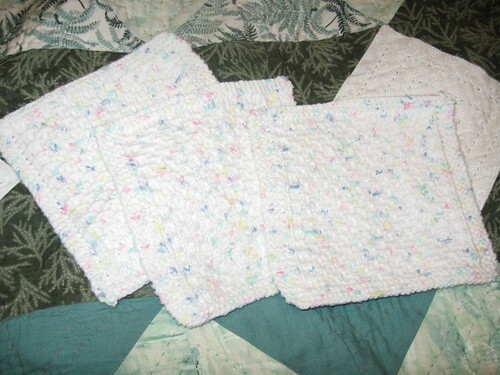 It is harder to curl up under a blanket to knit items like these that I sent off as part of my bloggy giveaway earlier this month. No matter what you do, bamboo knitting needles and heavy blankets just do not mix. Sure, I could bring my laptop into bed and do some blogging. Still the laptop is not easy to maneuver and type with when hidden under a mountain of blankets to keep warm. There is just something about snuggling up under a blanket and reading a great book at night when the weather is cold. Last week I read Mia King’s novel called Sweet Life. The story starts off in NYC and is about a couple that moves to Hawaii. Sounds wonderful to me now that the daytime high is only going to reach 30 degrees most days. The main character quickly finds that paradise is not an automatic thing, even in Hawaii. Marissa Price (the main character) and her husband struggle with the changes in their life and marriage. With great woman friends supporting her, Marissa is able to settle into life in paradise and eventually fix items in her personal life as well. I really enjoyed the cast of characters in this novel. King does a fabulous job establishing them quickly into the life of Marissa Price. Thanks to the bloggy world I heard about this wonderful book from many different people and went to get a copy to read. I enjoyed it so much that I went out to get King’s first novel Good Things. I hope to snuggle up under my blanket tonight to get started on this soon. What books are you reading right now? I could always use more suggestions for this long winter that is ahead of us. Happy reading! Let’s see… just finished The Wedding Officer by Anthony Capella for book club – we all hated it! Would not recommend it. We did all love The Book Thief by Markus Zusak last month – just a warning that while it’s YA, it’s not an easy book to read due to the subject matter. I also really enjoyed Run by Ann Patchett. You may like People of the Book by Geraldine Brooks – it follows the story of a Haggadah, going back to when it was created in the 15th century. I personally didn’t really like this book that much but I know others that did, so take my opinion for what it’s worth! Oh and I read before bed, and often on Sundays while the boys are watching football. I’ve also been taking a book to work to read during lunch. Then my commute is a huge reading time for me. I won’t quite make my 50 books goal for the year, but I’m a lot closer than I’ve ever been. More blogs:) and The Faith of Barack Obama which is really good. I also am reading Taking Things Seriously . Maybe if the mood sits me I will get into the whole “Vampire” Twilight thing! I wish I could read a book! I have had the last book in the Sisterhood of the Traveling Pants series on my nightstand for almost a year now! Yes, I am eleven years old.